DID A VACCINE EXPERIMENT ON U.S. SOLDIERS CAUSE THE “SPANISH FLU” ? One hundred years later, it’s long past time to drop “Spanish” from all discussion of this pandemic. If the flu started at a United States military base in Kansas, then the disease could and should be more aptly named. In order to prevent future disasters, the US (and the rest of the world) must take a hard look at what really caused the pandemic. During the mid-2000’s there was much talk about “pandemic preparedness”. Influenza vaccine manufacturers in the United States received billions of taxpayer dollars to develop vaccines to make sure that we don’t have another lethal pandemic “flu”, like the one in 1918-19. Capitalizing on the “flu” part of Spanish flu helped vaccine manufacturers procure billion dollar checks from governments, even though scientists knew at the time that bacterial pneumonia was the real killer. It is not my opinion that bacterial pneumonia was the real killer - thousands of autopsies confirm this fact. According to a 2008 National Institute of Health paper, bacterial pneumonia was the killer in a minimum of 92.7% of the 1918-19 autopsies reviewed. It is likely higher than 92.7%. The researchers looked at more than 9000 autopsies, and “there were no negative (bacterial) lung culture results”. The soldiers developed flu-like symptoms. Bacterial meningitis, then and now, is known to mimic flu-like symptoms. (6) Perhaps the similarity of early symptoms of bacterial meningitis and bacterial pneumonia to symptoms of flu is why the vaccine experiments at Fort Riley have been able to escape scrutiny as a potential cause of the Spanish Flu for 100 years and counting. An article from 2008 on the CDC’s website describes how sick WWI soldiers could pass along the bacteria to others by becoming “cloud adults”. Three times in his report on the Fort Riley vaccine experiment, Dr. Gates states that some soldiers had a “severe reaction” indicating “an unusual individual susceptibility to the vaccine”. While the vaccine made many sick, it only killed those who were susceptible to it. Those who became sick and survived became “cloud adults” who spread the bacteria to others, which created more cloud adults, spreading to others where it killed the susceptible, repeating the cycle until there were no longer wartime unsanitary conditions, and there were no longer millions of soldiers to experiment on. 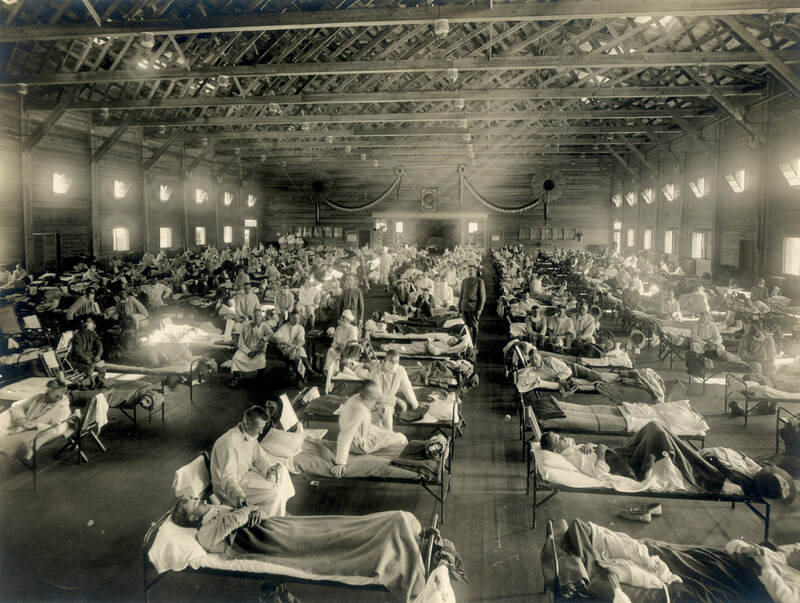 “… Fourteen of the largest training camps had reported influenza outbreaks in March, April, or May, and some of the infected troops carried the virus with them aboard ships to France … As soldiers in the trenches became sick, the military evacuated them from the front lines and replaced them with healthy men. This process continuously brought the virus into contact with new hosts—young, healthy soldiers in which it could adapt, reproduce, and become extremely virulent without danger of burning out. Is the bacterial serum made in horses at the Rockefeller Institute which was injected into US soldiers and distributed to numerous other countries responsible for the 50-100 million people killed by bacterial lung infections in 1918-19? The Institute says it distributed the bacterial serum to England, France, Belgium, Italy and other countries during WWI. Not enough is known about how these countries experimented on their soldiers. I hope independent researchers will take an honest look at these questions. I do not believe that anyone involved in these vaccine experiments was trying to harm anyone. Some will see the name Rockefeller and yell. “Illuminati!” or “culling the herd!” I do not believe that’s what happened. I believe standard medical hubris is responsible - doctors “playing God”, thinking they can tame nature without creating unanticipated problems. With medical hubris, I do not think the situation has changed materially over the past 100 years. The vaccine industry is always looking for human test subjects. They have the most success when they are able to find populations who are not in a position to refuse. Soldiers (9), infants, the disabled, prisoners, those in developing nations - anyone not in a position to refuse. In part because the global community is well aware of medical hubris and well aware of the poor record of medical ethics, the Universal Declaration on Bioethics and Human Rights developed international standards regarding the right to informed consent to preventative medical procedures like vaccination. The international community is well aware that the pharmaceutical industry makes mistakes and is always on the lookout for human test subjects. The Declaration states that individuals have the human right to consent to any preventative medical intervention like vaccination. Vaccines are not magic. (14) Human rights and bioethics are critically important. Policy makers should understand the history of medical hubris and protect individual and parental human rights as described in the Universal Declaration on Bioethics and Human Rights. Your generous contributions allow us to continue this series of articles and our other work. Thank you for your support!